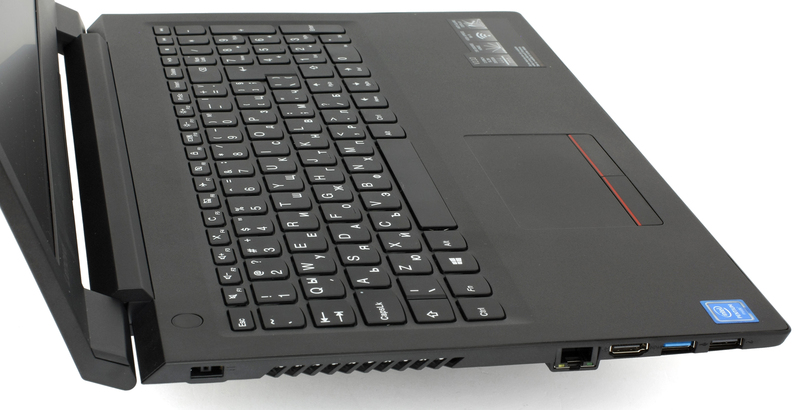 A few months back we reviewed the Lenovo Ideapad 110 and prior to that, the Ideapad 100. 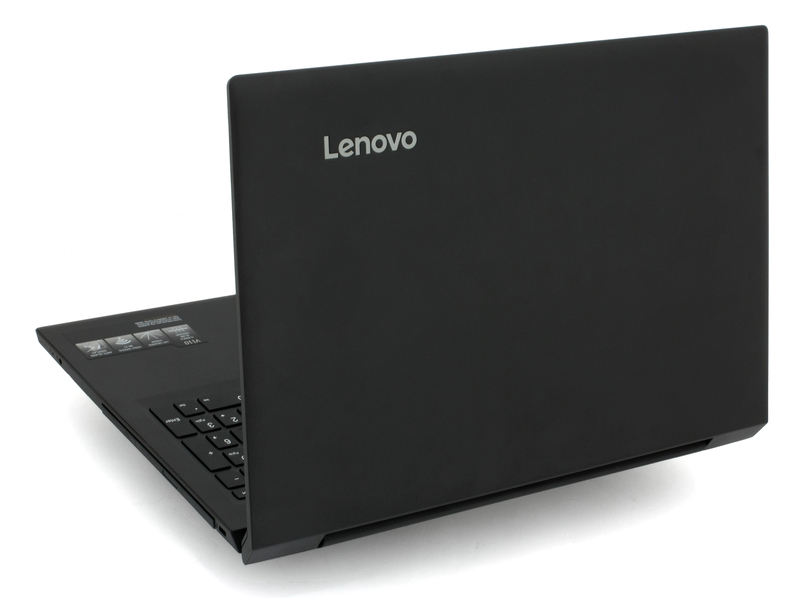 Both laptops are part of the ultra-low budget lineup from Lenovo offering very basic features and usability. 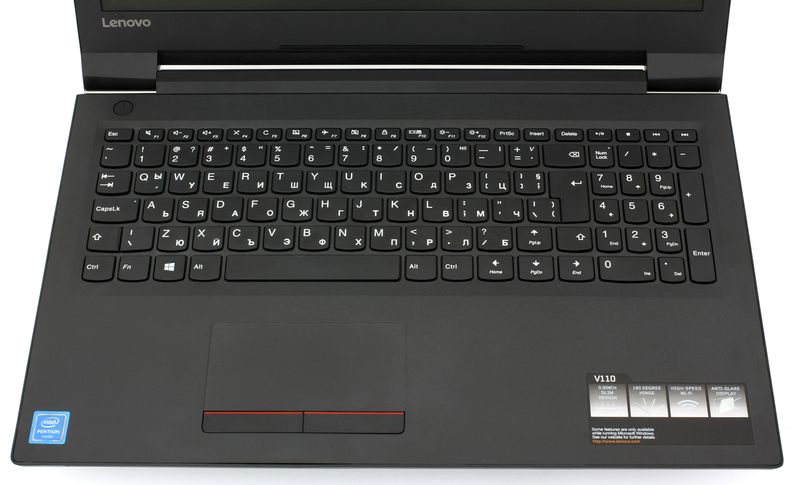 Now, we have the Ideapad V110’s review ready, which is basically the same notebook with identical aesthetics, input devices, upgrade options etc. But there’s one thing that promises big changes – the new Apollo Lake chip. The unit we are reviewing sports the brand new Intel Pentium N4200, which we had the chance to test a few months before the official release but it was a pre-production sample so the results were inconclusive. Anyway, there are configurations with more powerful processors from Intel’s Core family as well as even more affordable Celeron alternatives. The notebook itself has its strong points, mostly relying on the new processor sporting totally new architecture and as usual, there are some considerable weak points. It’s still hard to get picky, though, considering the absurdly low price tag of the notebook. If it’s available in your region, you can find it for as low as €200-250, just like its predecessors the Ideapad 110 and Ideapad 100. 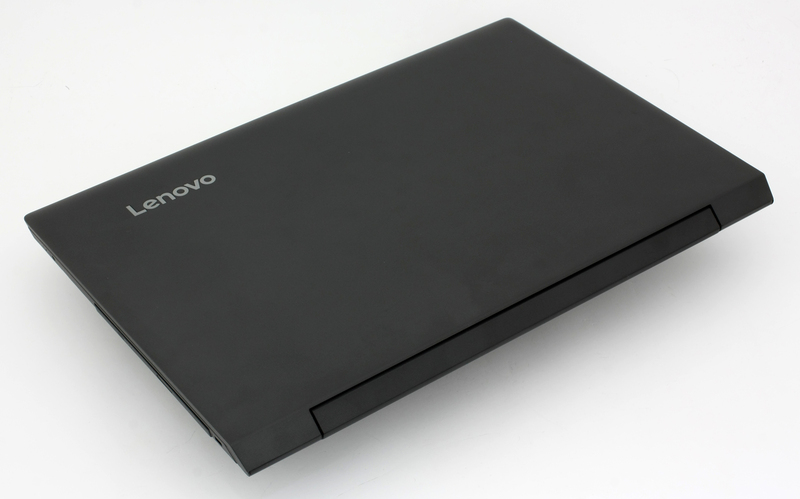 The modest package comes with the AC cord, power adapter, user manuals and the notebook itself. 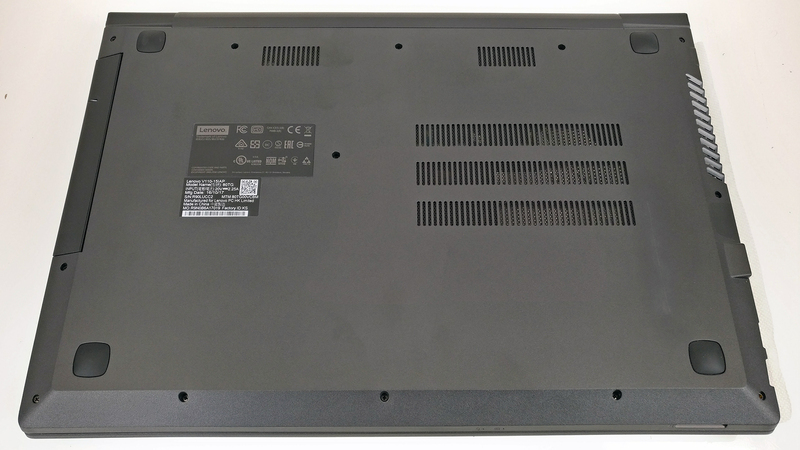 As we already pointed out, the chassis is almost identical to the Ideapad 110 with some changes made to the sides since the Pentium N4200 requires a standard cooling solution that includes a fan and a heat sink, while the previously reviewed model with Pentium N3710 relied on a passive cooling design. The lid retains the smooth, smudge magnet, yet grippy, surface but the plastic plate feels slightly more rigid than before. Bending the middle still causes ripples to appear on the LCD screen but twisting it isn’t very easy. Once again, the lid’s hinge is overly tightened and cannot be lifted with one hand and even with a tightly pulled hinge, we noticed some inconsistency in small movements, a slack. And as for the bottom piece, it uses the same finish and offers two big vent openings for extra airflow for the hardware. 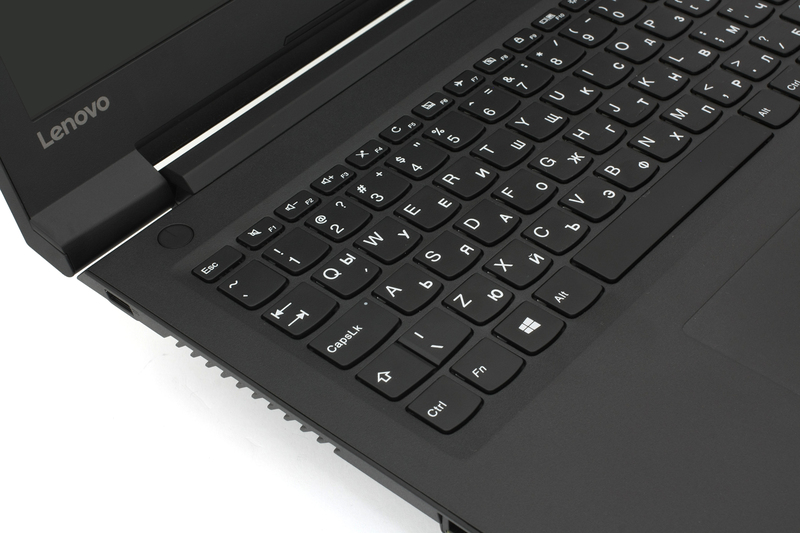 The sides of the machine remain mostly unchanged from the Ideapad 110, but some of the ports have been moved. For instance, the left side accommodates a few connectors less – one LAN port, HDMI, USB 3.0 and USB 2.0. There’s also the big grill for cooling and right next to it you will find the DC charging connector. No more awkward placing. And as for the right side, you will find the optical drive and the 3.5 mm audio jack. The SD card reader is positioned up front near the left edge. All ports are crammed up in a fairly thin design – 24 mm, which is a slight increase compared to the older Ideapad 110 (22.9 mm). Barely noticeable, though. 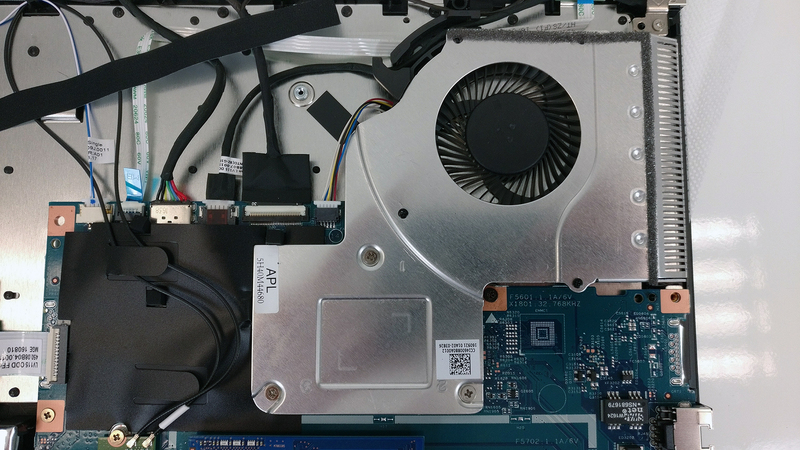 Probably the most familiar aspect of the laptop is the interior. We are happy to see the same AccuType keyboard with fairly short key travel compensating with clicky and responsive feedback. It’s generally a good keyboard and will fit most users. The touchpad is also meant for the non-pretentious users as it’s gliding surface is a bit rough and small while mouse clicks are slightly stiff. It’s responsive and accurate, nonetheless. What’s missing here is a bit more stability in the center of the keyboard tray. Even if lightly pressed, the surface sinks in quite a lot. 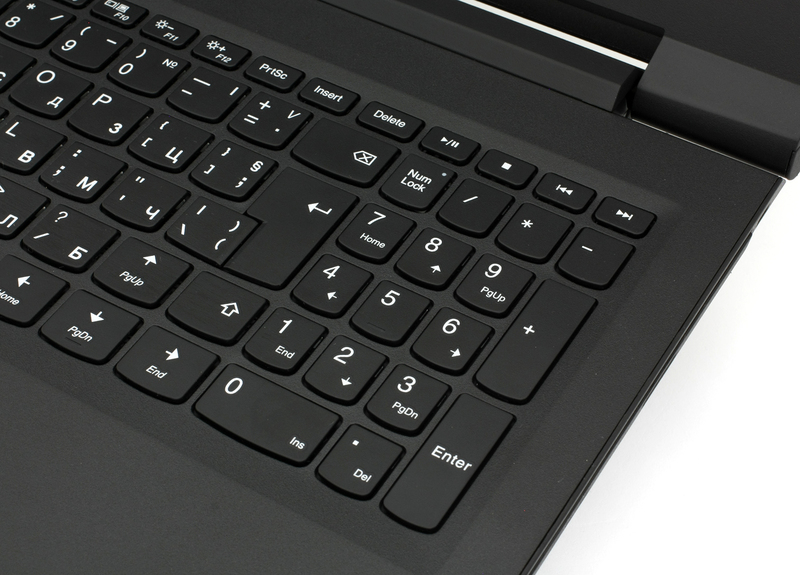 Since this is an entry-level machine, some of the cons can be ignored, like the short key travel, small touchpad or the suspicious hinge movements. However, the spongy keyboard area might get in the way of some users and consider the build quality poor. Still, the laptop compensates with fairly small dimensions and low weight (1.9 kg) making it a decent low-budget portable solution. 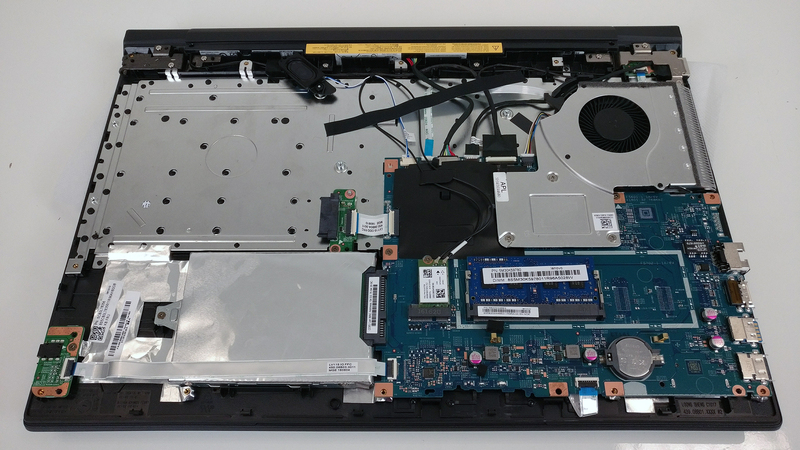 Quite expectedly, the notebook doesn’t offer a dedicated service cover so you need to take off the bottom plate in order to access the internals. Make sure you’ve removed the optical drive before proceeding. 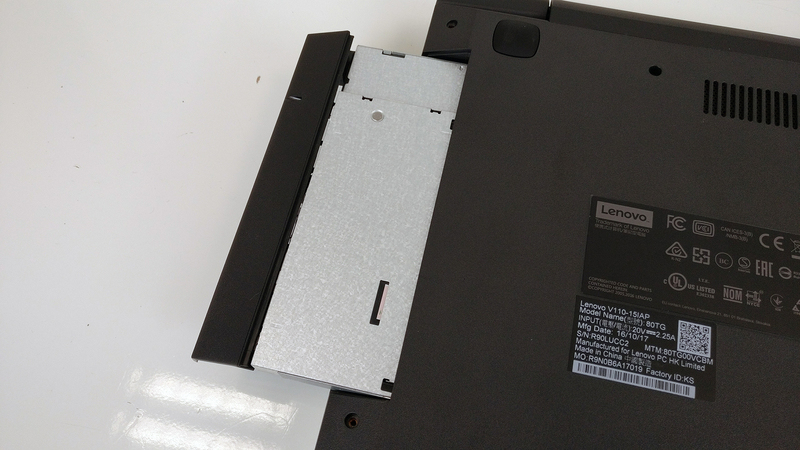 Of course, the notebook doesn’t offer an M.2 SSD slot and relies only on the 2.5-inch HDD. 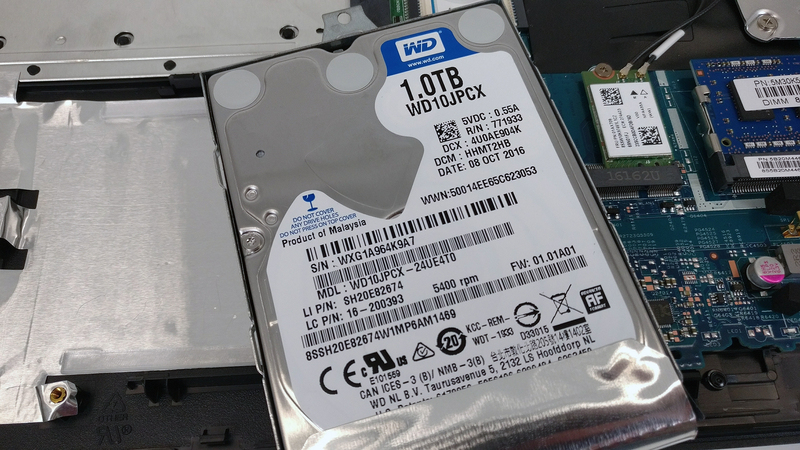 If you wish to expand your storage, the only way of doing so is to replace the optical drive with a caddy so you can stick a 2.5-inch HDD inside. 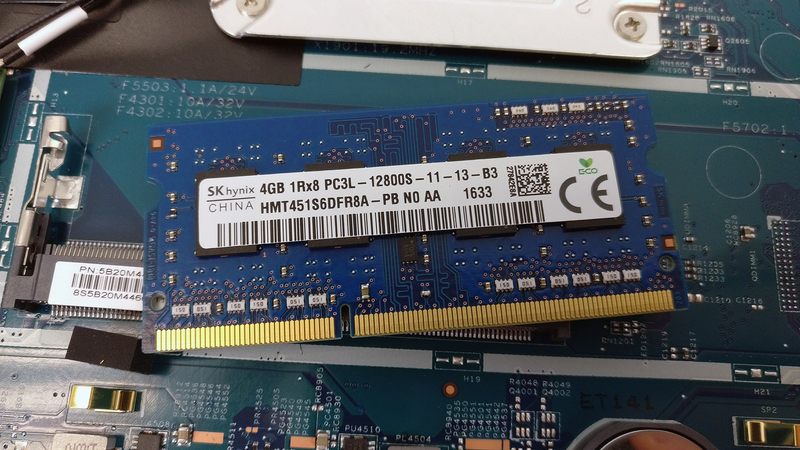 The motherboard holds only one RAM slot, which is taken by a 4GB DDR3L-1600 SK Hynix chip in our reviewed sample. 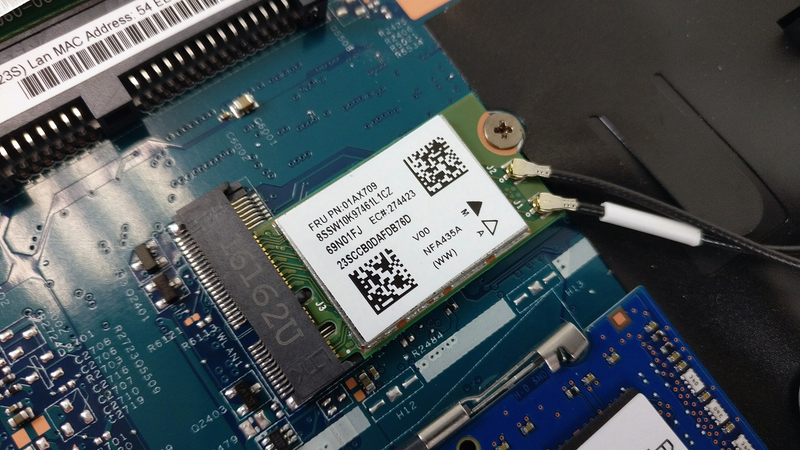 The Wi-Fi module is placed right next to the RAM chip slot. 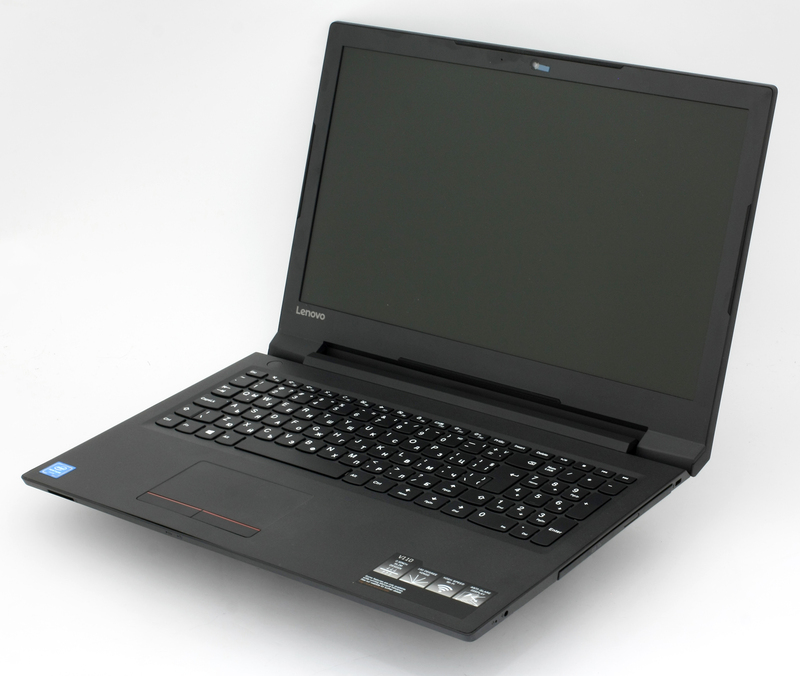 The cooling design is simple yet effective considering the undemanding Pentium N4200 CPU. 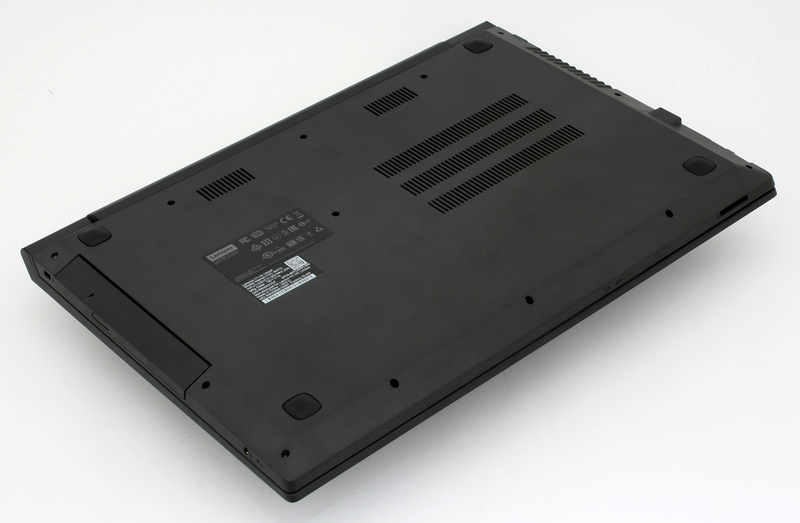 The Ideapad V110 offers an HD (1366×768) TN display manufactured by BOE with model number NT156WHM-N42 making up for 100 ppi and 0.253 x 0.253 mm pixel pitch. It can be considered as “Retina” when viewed from a distance equal or greater than 86 cm. Viewing angles are bad, as expected, due to the TN panel. However, we were pretty surprised by the high maximum brightness that the panel offers. Usually, laptops offering low-end TN panels don’t go higher than 190-200 cd/m2 but this one scored 247 cd/m2 in the center of the screen and 240 cd/m2 as average across the surface with only 8% deviation in the lower right corner. We did notice something wrong with the color temperature, though. At maximum brightness level, the color temperature is a bit warmer than usual – 5900K but as we go along the grayscale, the color temperature gets a lot colder with CCT (correlated color temperature) even reaching 8500K at 75% RGB. Our profiles fix this. We’ve also recorded a contrast ratio of just 300:1. 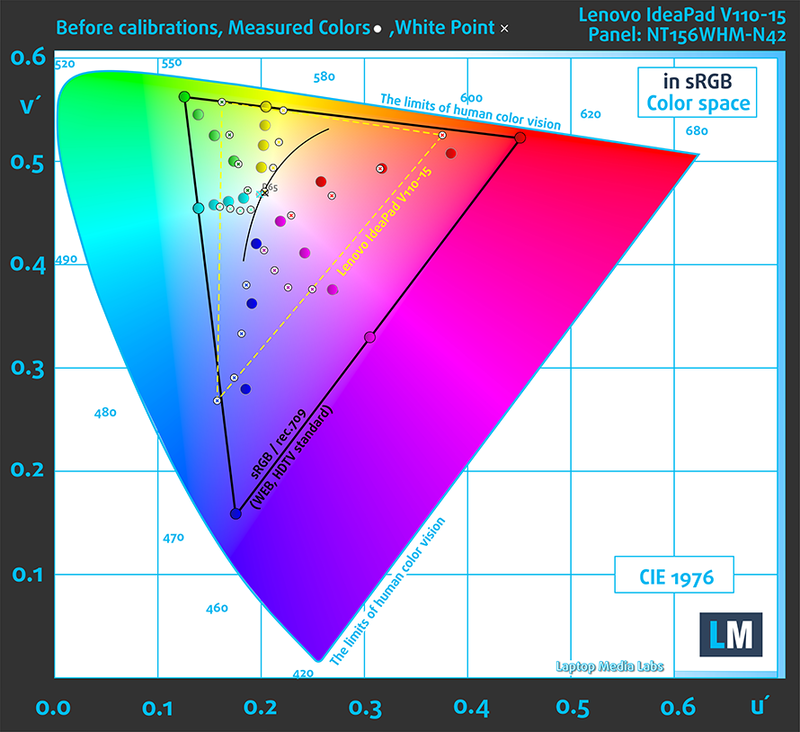 The color deviation dE2000 to the center of the screen reaches only 1.8, which is an excellent result because values above 4.0 are unwanted. The yellow dotted triangle in the graph below represents the display’s sRGB color gamut coverage, which is just 49%. We’ve created a profile with 140 cd/m2 luminance, D65(6500K) white point and 2.2 gamma. We tested the accuracy of the display with 24 commonly used colors like light and dark human skin, blue sky, green grass, orange etc. You can check out the results at factory condition and also, with the Office Work & Web Design profile. We recorded Fall Time + Rise Time = 12.5 ms. Unfortunately, the display uses PWM and the low frequency (220 Hz) of the emitted light can be considered as “aggressive”. 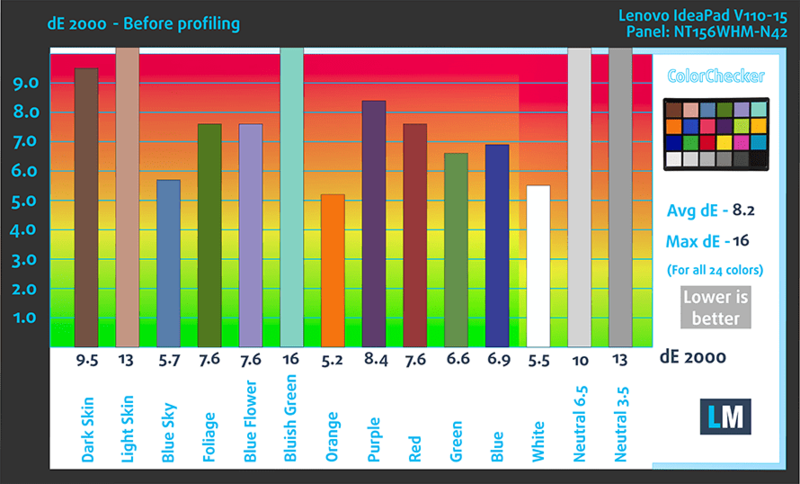 We really can’t get too picky when it comes to low-end laptops with TN displays but some of the drawbacks are apparent – narrow sRGB coverage, low contrast, poor viewing angles and aggressive PWM. But to be honest, that’s what the industry offers at this price range. We can’t miss mentioning, though, the higher than usual maximum brightness that can come in handy to some users. Some of the issues with color accuracy, suboptimal color temperature and PWM can be easily fixed by installing one of our profiles. There are noticeable distortions in low and high frequencies while the maximum volume is kind of low. The specs sheet provided below is for this model only and may vary depending on your region or configuration. We used a fresh install of Windows 10 (64-bit) for the writing of this review. 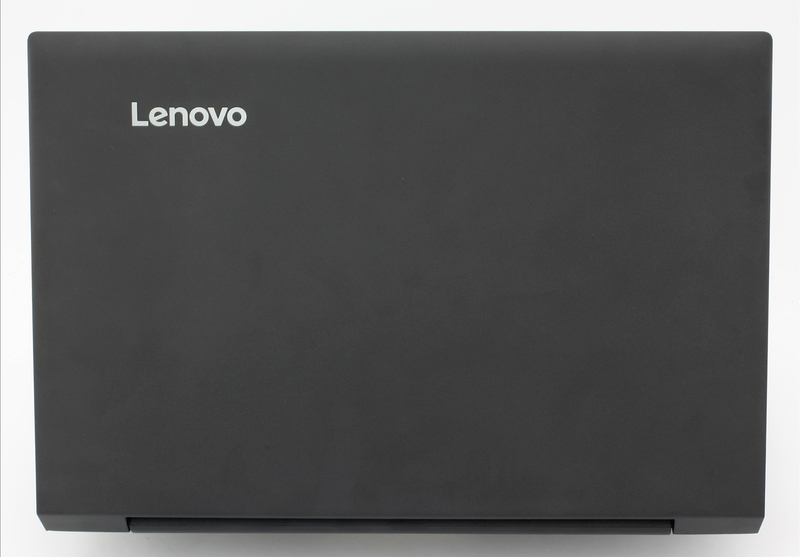 If you wish to do the same, we suggest downloading the latest drivers from Lenovo’s official website. With the new Goldmont architecture used for the making of modern Apollo Lake processors, Intel promised a significant improvement in performance and power efficiency. Well, they delivered. 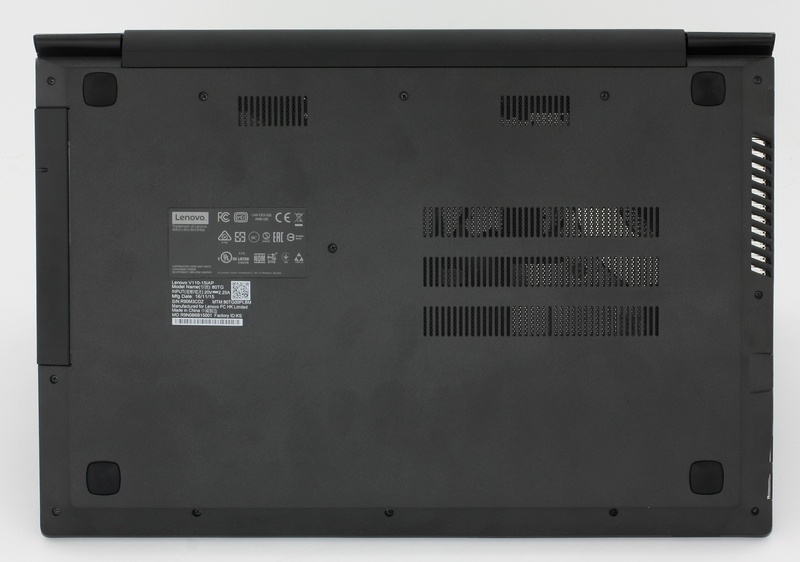 The old Ideapad 110 notebook, which had a passive cooling solution for the Pentium N3710, offered fairly low battery runtime while the new Pentium N4200 processor runs on standard fan-based cooling design and beats its predecessor in terms of efficiency by 30-33% as both systems use the same battery rated at 24Wh. This is definitely a win in our books. Of course, all tests were performed using the same configuration as always – Wi-Fi turned on, Windows battery saving feature switched on and screen brightness set to 120 cd/m2. As we already said, the notebook scored pretty well in our web browsing battery test – 251 minutes (4 hours and 11 minutes). Surprisingly, the notebook scored better in the video playback test – 261 minutes (4 hours and 21 minutes). For accurate simulation, we used the Metro Last Light benchmark running on loop with graphic settings set to minimum. This test got the most of the battery since it’s the most demanding one – 113 (1 hour and 53 minutes). Fritz is a chess benchmark that tests the computing capabilities of the CPU with various chess moves. The Intel Pentium N4200 managed to get 3.675 million moves per second. For comparison, one of the most powerful PCs, Deep(er) Blue, was able to squeeze out 200 million moves per second. In 1997 Deep(er) Blue even beat the famous Garry Kasparov with 3.5 to 2.5. The two-staged stress test doesn’t represent real-life use since the general user won’t be able to maintain such heavy workload for long periods of time but it’s still a good way to assess the overall stability of the system in the long run. 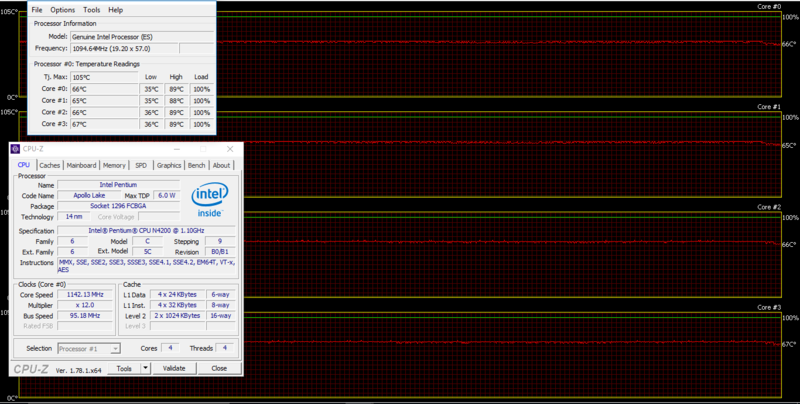 We started with 100% CPU load for an hour and it seems that the conventional cooling design assures good temperatures under load and allows the CPU to stretch its “legs” to the full extent by utilizing the 2.5 GHz clock speeds for a while before going down to 1.6-1.7 GHz. Interestingly, after we switched on the GPU stress test, the CPU’s frequency didn’t go below 1.1 GHz while still giving enough headroom for the iGPU to perform. There wasn’t even noticeable change in temperatures. Of course, the Pentium N4200 isn’t powerful enough to generate so much heat as you can see on the heat map below. 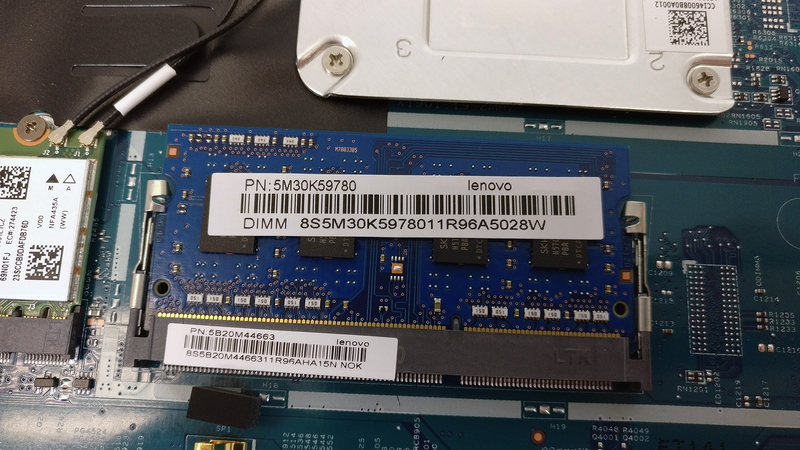 Some of the issues from the last generation Ideapad 110 have not be resolved but the new Pentium N4200 makes the working experience on the Ideapad V110 much better than before. The performance increase isn’t marginal as we are used to seeing while the battery life has been largely improved and again, all thanks to the new Apollo Lake chip. 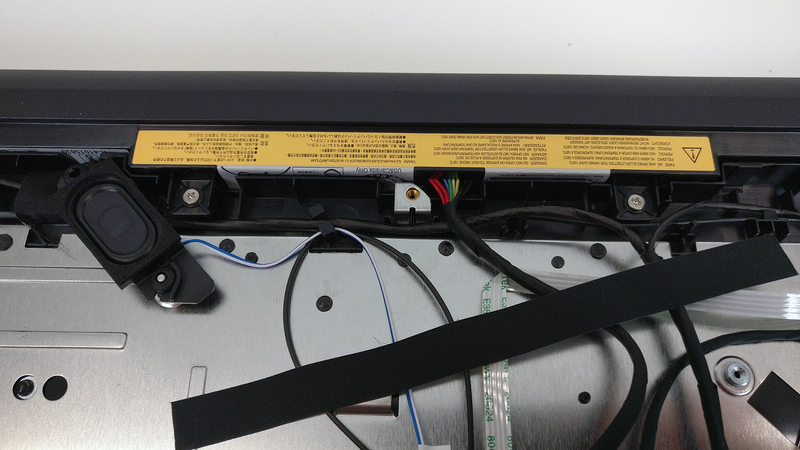 As we mentioned above, some of the drawbacks like spongy keyboard, slightly unstable hinge and stiff mouse buttons are still present with the V110. Still, the input devices offer good usability overall. And as far as the display is concerned, it carries the usual drawbacks that low-end TN panels have but we do have to give credit to the higher than usual maximum brightness. Luckily, the aggressive PWM, imbalanced white point and color accuracy can be fixed by installing our profiles. In the end, the Ideapad V110 can still be considered as one of the most reliable and affordable everyday solutions on the market. The new Pentium N4200 definitely makes it worthwhile but don’t expect anything more than just browsing, working and general multitasking on the machine. My Lenovo V110 makes a lot of noise, how do i fix this?